Are You Missing A Piece of Business? A guest arrived with a pumpkin pie, but a slice was missing, leading to my asking ‘are you missing a piece of business?’ As startling as the gift of the dessert was, it is an eye-opener for what salespeople and entrepreneurs occasionally overlook. Successful salespeople are entrepreneurial in thinking. It is critical to regularly review all habits and venues that go into our systematic process. As society advances, there is a need not only to patch the missing piece(s) of business but also implement new ideas. What if they had thought ahead about what technology holds in store? Perhaps their missing piece(s) could have been implemented and thousands of jobs saved. I’m not the executive of the company, just writing out possibilities. And writing out or discussing the current methods versus new ideas is the practice we all need to consider. Discussing a possible missing piece of business is an excellent exercise for team meetings. Not only does the welcoming of ideas bring about a new possibility, but it also adds to a team spirit where the players want to help. When salespeople are motivated to be of service, they turn the energy into selling more. And in recognizing they are valued, the same salespeople remain at the company for the longer term. The revolving door syndrome (employee in – employee out) ceases, and the bottom-line improves. Solo entrepreneurs gain ideas from their peers, do research, and attend events. Not all suggestions work out. However, it is the attempts that help us refine the effort to see improvement. Do You Realize Salespeople Are to Be Entrepreneurial Minded? Who Are You Trying to Attract? Are You Needlessly Losing Business? 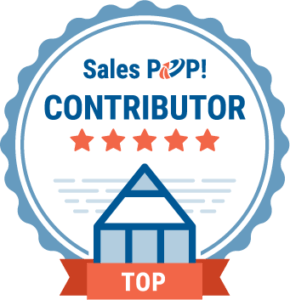 Listen to the top-down podcast featuring sales management stories. 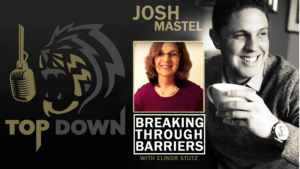 Elinor Stutz speaks on the topic of “Breaking through Barriers” with host Josh Mastel, UpRoar Partners. Also, find the transcript and motivational quotes provided to help you break through your barriers. Being in business for yourself or a company can be exhilarating, but is frequently stressful. One sign of stress is the battle with the sleepless nights. A nearby notepad significantly helps. You can capture the bothering thoughts for the next day’s work while hopefully enabling sleep. On your time out from work, consider where you may improve the effort. Review your habits to ensure you do not have a missing piece of business. Have a trusted group to discuss new technology and how to implement? Are You Ready to Adjust Your Goals for 2019? Readjust both quarterly and monthly goals as progress takes place? Having your eye on set goals as you relentlessly pursue business is essential for achieving them. At the same time, tweaks or elimination of what is in place will help prevent the missing piece of business. Insights from others are plentiful, but your job is to select the best. When you hear, ‘you should do…’ only do it if it appeals to you. Otherwise, let the idea pass and be alert to the next. One other qualifier before attempting to satisfy the missing piece of business is to be confident it fills the empty spot well. The new should both complement what is already in place and also enhance the plan on its own. As clients see you working on improving your business model, they will be far more likely to take an interest in what you have to sell. Today’s blog is provided to help you achieve the Smooth Sale!